You will be given a reference e-book to read which has 310 pages And the test will be based on that e-book , you can take final test within 1 year of purchase. Acupressure which involves the application of acupressure physical pressure to acupuncture points by using elbows, hands or any other effective devices. Ayurveda which is usually performed by at least one or two therapists who uses a heated mixture of herbal oils basing on the popular ayurvedic humors system. Bowen Therapy which involves the process of providing rolling movements over your muscles, tendons, joints, ligaments and fascia. Deep Tissue Massage which is primarily designed to obtain relief from extreme muscle, connective tissue and fascia tension and focuses on improving the muscles situated right below your top muscles’ surface. If you want to become a certified massage professional, then you have to know that Brainmeasures, a popular online certification company known for its effectiveness in providing the most comprehensive online certification courses, is now offering a massage certification course. The massage course which is now available at Brainmeasures aims to provide you with a more comprehensive background about the different massage methods that are introduced to the public and the basic procedures involved in performing them. You can expect this certification course to offer a well-detailed massage training which is guaranteed to help you understand the history of massage, the different techniques that you can use when performing it, the individual benefits of each massage method and the best things that you can do to offer the highest level of satisfaction, relaxation and health to your clients. 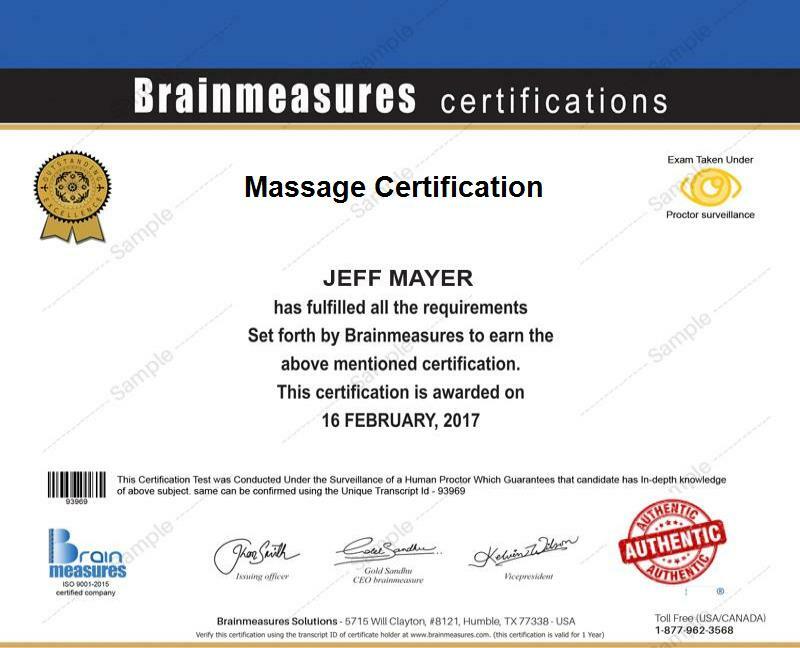 As soon as Brainmeasures furnishes you with your massage certificate, you can start offering your expert services in this field for a fee. How the different types of massage works in improving your health, wellbeing and your entire life? What to expect if you establish a career in the massage industry? The massage certification program which is now easily accessible at Brainmeasures is ideal for you especially if you plan on mastering the techniques associated to offering an effective massage. You can expect this certification program to work even more ideally for all aspiring massage therapists and experts who want to make sure that they will continuously offer the safest, gentlest, healthiest and the most non-invasive massage therapies, techniques and modalities to their clients. Successfully completing your massage certification course is proven to be very rewarding because it allows you to enjoy a career with more flexible hours and lets you achieve extreme satisfaction since you can make your clients feel better while making a good living out of it. If you are already a massage certification holder, then you can expect to work as a certified massage therapist which allows you to charge your clients around $25 to $100 per hour. You can also expect to earn as much as $86,000 per year through it. You can earn even more if you are able to successfully run a massage business.